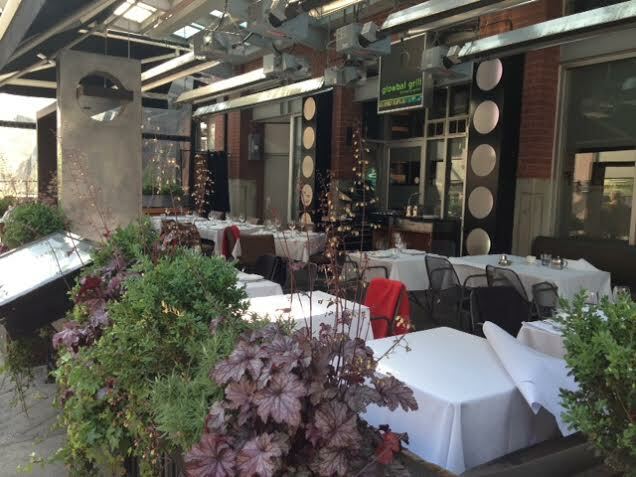 Next up on our patio series is Yaletown, the place to patio-hop. 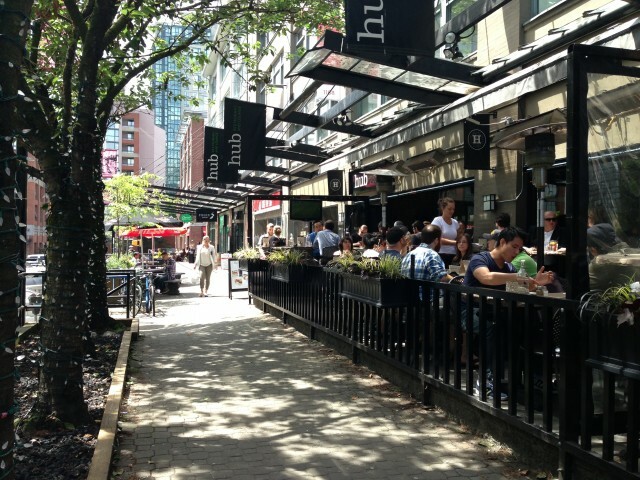 Yaletown is packed with more patios than any other area in Vancouver. The highest concentration is on Hamilton and Mainland streets – they stretch through patio land like a red carpet. Yaletown patios are a seamless extension of their dining area, like somebody lifted their wall and a bit of the restaurant spilled out onto the side path. 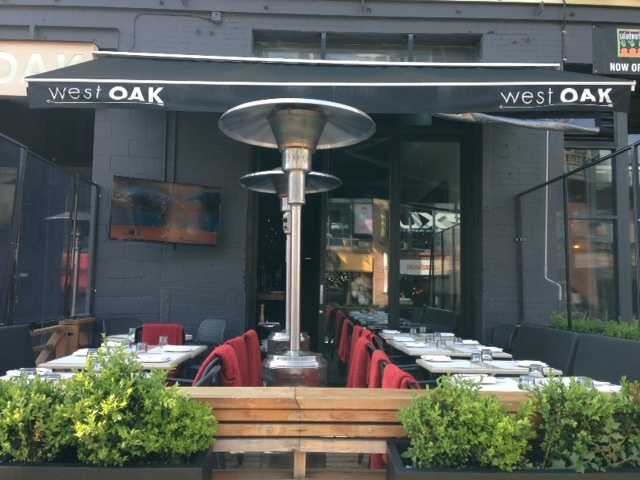 All of the patios offer amazing food, service and ambiance, but, unfortunately, not all can be lumped into a ‘best of’ list. The challenge is in plucking out the best of the best. This may be the most contentious patio list yet. 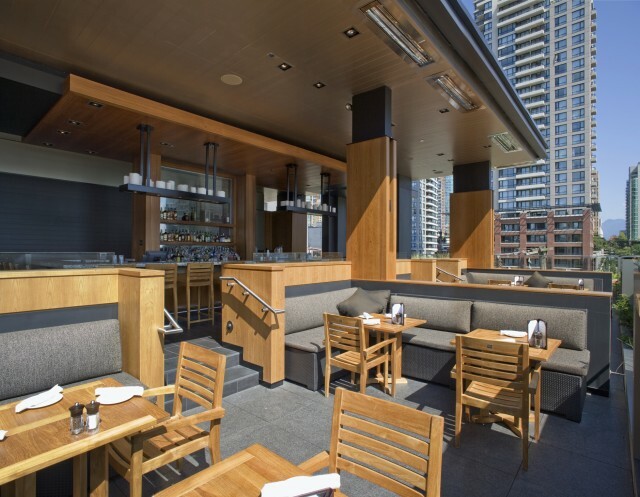 The Keg Steakhouse & Bar’s rooftop patio is as close to heaven as you can get in Yaletown. The patio design concept is a restaurant on a roof complete with a kitchen, full bar and tables with booth seating. Enjoy a summer-inspired cocktail with a steak while watching seagulls fly past. Signature drink: Pair your red meat with a red wine from their extensive wine list. 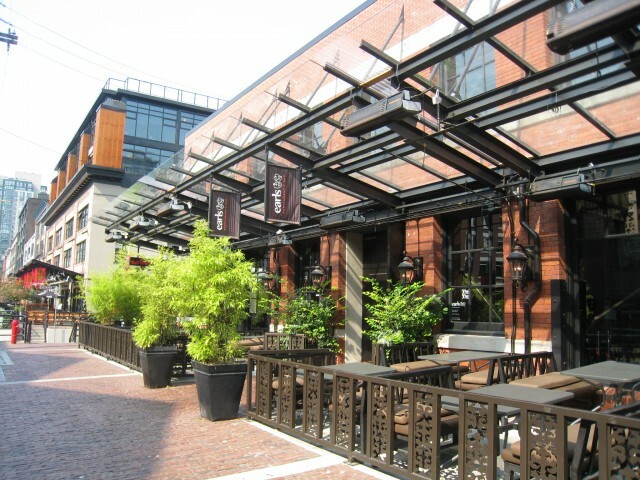 Yaletown Brewing Company is one of the longest-running restaurant/bars in Yaletown. Established in 1994, one half of this brewery is a bar with a lounge-style patio and the other half is restaurant with a dining patio offering booths. Plunge into the mature, professional, yet friendly crowd with one of their finely crafted brews and hot wings. Signature drink: a sampler with your choice of four in-house crafted brews. Hurricane Grill is situated by the harbour and nestled in among Yaletown’s condos. This patio boasts views of False Creek, the sea wall and Yaletown’s residents. This is prime people-watching, folks. Signature drink: Blood Alley – vodka, scotch and Blood Orange San Pellegrino. Signature dish: Ultimate Burger – Pasilla BBQ sauce, bacon, cheddar and sauteed mushrooms. 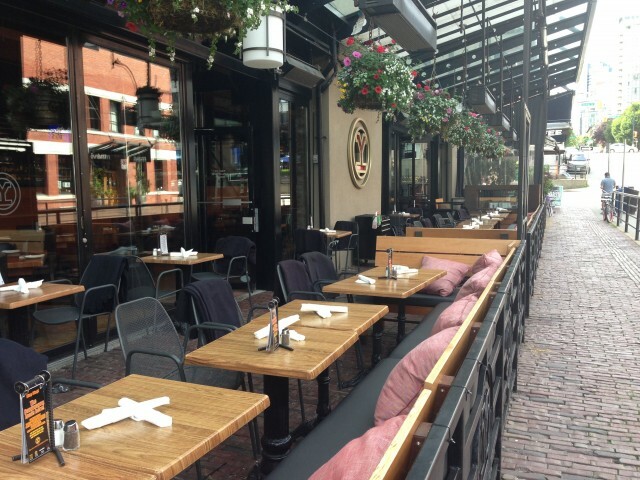 Earls’ patio is elegant, comfortable and the booth seating offers patrons a touch of privacy. This patio is perfect for a first or second date. Though, if you’re sitting near the sidewalk you risk being under the scrutiny of passersby. Note to passersby – this is entertainment. Signature drink: Frozen White Peach Bellini – Appleton Estate vx rum, white wine, peaches and sangria. Signature dish: Chicken, Brie and Fig sandwich – roasted apples, spinach, sweet fig jam, garlic mayo and house-baked ciabatta. 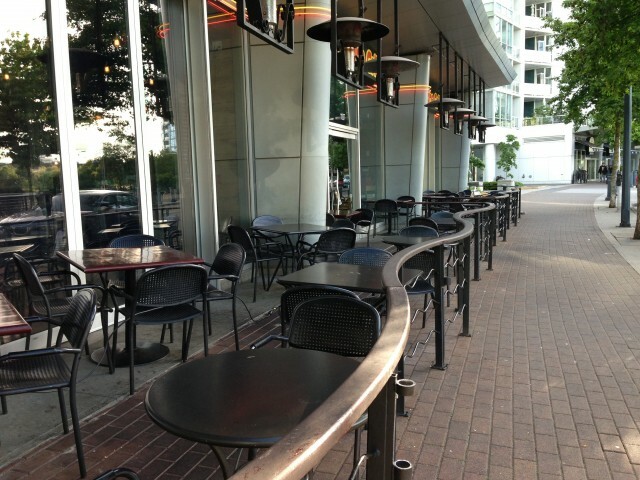 The Hub Restaurant and Lounge patio is perfect for sports fans, casual or extreme, because there are TVs ON THE PATIO. For sporting events, The Hub likes to facilitate games with their clientele and the prizes are usually in the form of shooters. For game days or UFC matches in the summer – get here early. Signature drink: Caesars – five to choose from and all are doubles. Signature dish: Crack – cracked peppercorn encrusted patty, pesto mayo, Monterey Jack cheese and onion rings. This French-inspired restaurant has a beautifully rustic patio complete with ornate fencing and Parisian-style lights overhead. Their chicken, roasted in an imported rotisserie, and potatoes (roasted underneath the chicken so it catches the drippings) are what keep this establishment the most packed in Vancouver. Signature drink: Strapping Sipper – Jim Bean Black, amaro, limoncetta, lime, demerara and bitters. Signature dish: Rotisserie chicken served with pee wee potatoes and chicken jus. The high-powered intensity of the heat lamps and transparent tarpaulin make this patio non-seasonal. But, come the high-temps of summer and this patio is ready to bare all along with the rest of us. 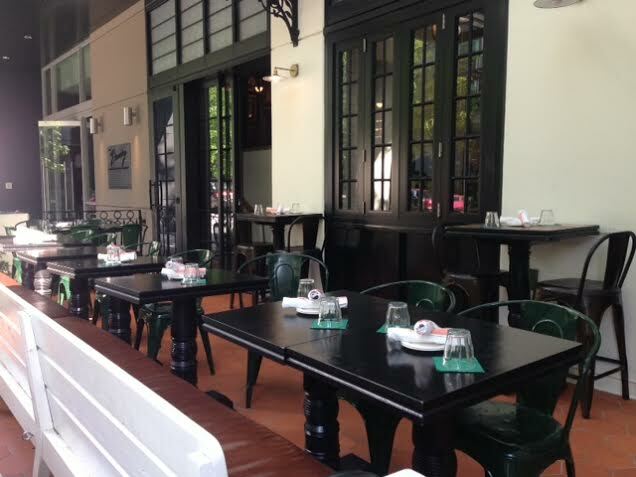 This upscale patio has all of the fixings of a classy restaurant, sans walls. 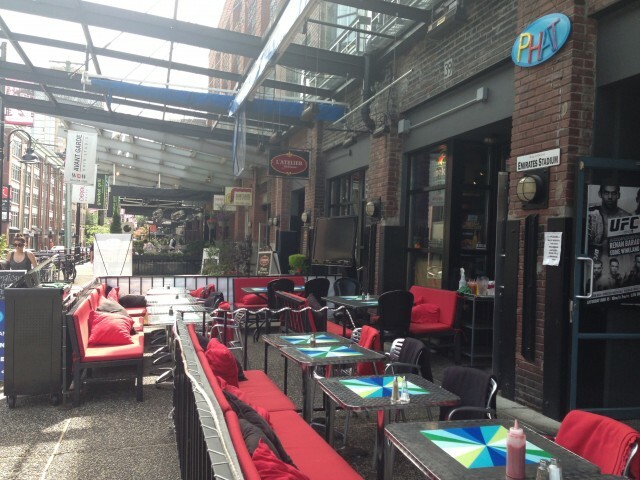 Quickly becoming a popular Yaletown haunt, this patio extends from the dining area and juts out into the Yaletown strip. Their earth-friendly menu consists of locally-sourced ingredients, grass-fed beef, free-range chicken and ocean-wise seafood. Laze the day away on this patio and at night head inside to the party. Signature drink: The Good Thyme – Bombay Sapphire Gin, fresh thyme, blueberry juice and fresh lime. Signature dish: West OAK Bolognese – beef, chorizo, spinach, mushrooms, peppers and San Marzano tomatoes. A deli turned sports bar, Phat Sports Bar and Restaurant’s patio is phresh. Two 55-inch TVs adorn either side of the retro-inspired patio and rope lights wrap around the patio fence. Phat is well-known for their Montreal smoked meat (flown in from Montreal) and Canucks’ sightings. Signature drink: Choose from their espresso bar menu or domestic beer. Signature dish: Hot Montreal Smoked Meat – flown in from Montreal. Paulies Kitchen is the new kid on the block serving up gourmet Italian meatballs and drinks from its sister bar next door, The Distillery. The bar features infused vodkas and gins distilled in their very own imported Bavarian still. This is the new venture by the Mark James Group (Yaletown Brewing Company) and is located where the famous post no bills wall used to be. Huge and covered with a candy stripe awning, you cannot miss this patio. Signature drink: Cocktails on tap – batched cocktails, mixed perfectly and poured quick and easy. Signature dish: Meatballs baked in marinara sauce. 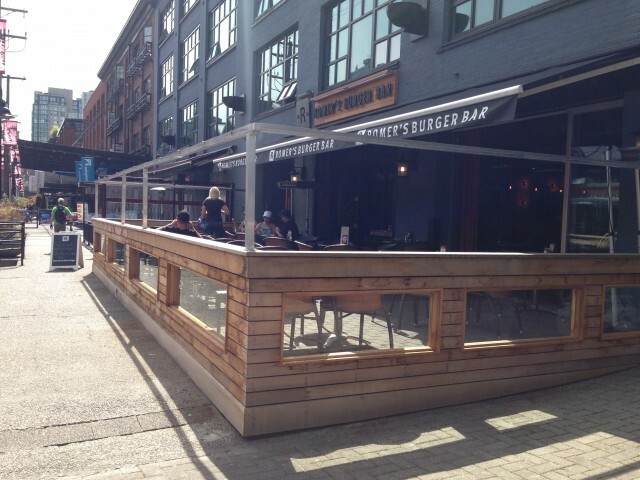 Romer’s Burger Bar is also new to Yaletown. Their newly constructed patio is fairly non-descript, but it stretches further out onto the sidewalk than the others. 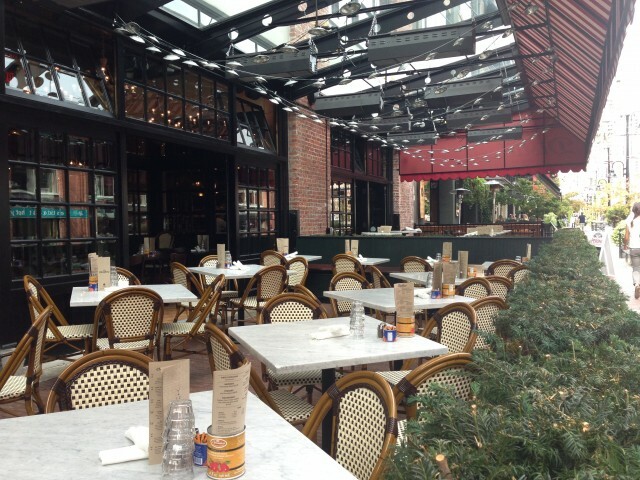 As the sun passes over Yaletown, this patio gets the last of the sunshine. Signature dish: Man’s Man Burger – thick applewood bacon, amber ale cheddar, smoked alder salts, onion strings, vine-ripened tomato, whole grain mustard, olive oil mayo.